We accelerate projects which are not commercially interesting but are extremely important from a fundamental point of view to help humanity move forward. As a consequence ScimPulse calls on the responsibility- and the feeling of helping humanity, in order to carry its ambition to accelerate as much projects as possible that contribute to the well being of all mind kind. For this we need all kinds of funding, ranging from monetary support, to facilities and human resources (peer advice and sounding boards) . In principle we only work open source, so no patents, exclusivity and/or intellectual property. What we do can offer is i.e. first right of use, this means that the donor/funder can get a pre-view on the outcomes of the projects and can get some advantage there. On individual basis, this can be arranged in an agreement between ScimPulse and the donor/funder. ScimPulse has an ” ANBI status”. This means that the Dutch Government / tax-authorities, recognized the Foundation as a PBO (Public Benefit Organization). In the latter of this page, more information is published on ANBI status and the possible favorable consequences for your taxes. To support an agricultural model that would meet today’s production and logistic challenges, while being more sustainable, and friendly to emerging cultural sensitivities, than the incumbent “industrialised” approach. The project will collect and complete the knowledge base necessary to produce yeld forecasts for multi-cultures, and the decision assistance toolkit that would help optimise the planning of a systems engineering of high-efficiency/high-resilience cultures. To develop and distribute an acoustic virtual “gym” to train human echolocation, the often underdeveloped ability to locate and identify objects and obstacles in one’ surroundings by relying on features in the acoustic landscape surrounding the individual. The project has already developed a proof of concept virtual reality that is in use to study user experience and to gain insights into potentials for development beyond the original intended use, to strengthen the case for its sustainability. The goal is currently to develop adequate user interface, and to transfer the application on cloud infrastructures to provide ease of access to adequate computational resources, and social network features to make the training environment up to the best evidences in pedagogy. To evaluate the cultural and social determinants of malnutrition in Europe. After decades of educational campaigns and medical interventions on dietary habits and physical activity, in EU we are facing an epidemics of obesity and malnutrition. Adopting an ethnographical approach, we follow the activity of a team of expert paediatricians and dieticians to study what barriers cause the abandon of dietary good practices even by people who apparently benefit from them in the first 6-12 months. The goal is to shape strategies to further the effectiveness of investments in public health and prevention at the scale of families. Inspired by grassroots initiatives that spread in EU during the failing of national welfare at the peak of the crisis originated in 2008/2009, we have been analysing the legal framework and quality requirements to run clinics that could lower the costs by leveraging coproduction schemes. In collaboration with WHO and a few National Governments (Bolivia, Nepal, …) we aim to run a small number of sandboxes to study the impact on quality of care and sustainability of running under such business models of continuing education and participation. Inspired by the special needs of imaging diagnostics in rural and remote areas of LMICs, we have started the feasibility study of a new x-ray technology. We plan to substitute the silicon used in most current digital medical x-ray detectors with materials with better positioned gap-bands that are today easier to work with than 20-15 years ago when the current technology got established, by adopting the latest read out electronic solutions for phase contrast, de-noising and compression, inspired by high-energy physics experiments at CERN, and by redesigning from scratch the energy management system (high capacity condensators) and beam delivery (structured, pulsed emission). By meeting extreme requirements of lower energy footprints, lightweight for transportation, and lower IT requirements, we should be able to produce a solution appetising also for western world countries. In collaboration with our partner CERN openlab, we will explore the potential of machine learning and big data analytics in occupational medicine and epidemiology. While CERN explores new technical solutions to monitor the large data flows of industrial controls produced by its unique accelerator, and to speed up novelty discovery in physics data produced by its largest experiments seeking for new physics after the discovery of the Higg’s boson, we will have the unique opportunity to test the translation of these technologies to human centred use cases, on health and medical data volunteered by the International scientific community of CERN. A unique opportunity, which could reach over 15000 individuals, from 122 countries in the world, all sharing similar working condition, and educational achievements. In May 2018 the European Atherosclerosis Society (EAS) will hold its meeting in Lisbon. We have received mandate to arrange a satellite on “medical technologies and the future of personalised medicine” that will be held in Sintra or Cascais. Based on projections from previous years’ editions, this should attract around 600 participants, mostly medical doctors from cardiology and neurology, and a smaller group of biomedical engineers. ANBI status and what it could mean for you! 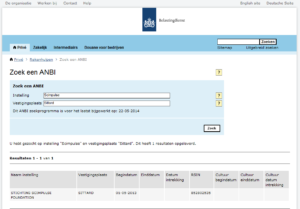 The “ANBI status” is granted by the Dutch Tax-authorities after meeting the demands of the tax authorities. Since January 1st 2014 these demands have become much more strict then they used to be. The reason why is that it can be seen as a reassurance that donations will truly go to the public benefit and donators will get tax advantages in return for their donation. In this way the government gives support to the greater good of PBO organizations. ScimPulse is awarded with this earmark retroactively from the day it was founded – 1st of May 2013 – on 30th of April 2014. The institution is not a company with capital divided into shares, a cooperative, a mutual insurance society or another body that may issue participation certificates. At least 90% of the institutions efforts must be focused on the general good. This is referred to as the 90% requirement. The institution and the persons directly involved in the institution must comply with the integrity requirements. A director or person determining the policy may not treat the institutions assets as personal assets. The assets must be segregated. A PBO may not retain more assets than reasonably required for the institutions work. For this reason the institutions assets must remain limited. The directors’ remuneration must be restricted to an expense allowance or a minimum attendance fee. A PBO must possess an up-to-date policy plan. The PBOs costs must be in reasonable proportion to its expenditure. Funds remaining after the dissolution of the institution must be allocated to a general good objective identical to the institutions objective. A PBO is governed by specific administrative obligations. The donations to a PBO (ANBI) are always deductible from-and-up to a certain amount and can be periodic or incidental, in cash or in kind. In all cases a confirmation from the foundation (if certain formal formats are met) is sufficient to be entitled to the tax deduction. Private donations: are deductible for income tax as from € 60,- till 10% of your annual income (“drempel inkomen”). A bank statement of your donation is sufficient for deduction. Company donations: are deductible from profit tax up to 50% of the annual profit to a maximum of € 100.000,- a year. The Foundation will hand over a formal confirmation of the gift. Printscreen of the tax authorities site showing the registration of ScimPulse as ANBI recognized foundation.